How Does a Submarine Submerge? Submarines float on the surface by using ballast tanks full of air. There are valves at the top of the ballast tanks that are opened when it's time for the submarine to submerge. As the air escapes, seawater comes in a the bottom of the tank. It makes the sub heavier, and then it submerges. It takes four people on duty to drive the submarine whether on the surface or submerged. The front junior enlisted members are the helmsman and planesman. They steer left and right and up and down using controls to adjust the rudder and diving planes. The officer in charge is the diving officer who oversees their every action. A fourth member of the watch team, the Chief of the Watch, sits near and operates the Ballast Control Panel (BCP). The BCP is in control of the ballasts which submerges and surfaces the boat as well as maintains the buoyancy and trim when submerged. How Does a Submarine Surface? One way a submarine can surface is called blowing to the surface. To do this, high-pressure air is blown into the ballast tanks to replace the seawater. It's the weight of the seawater that is keeping the sub underwater, so displacing it makes the sub rise to the surface. Another way is to drive to the surface. A submarine has planes along its stem, bow, and superstructure. By angling them, the submarine can rise as it cruises. Once on the surface, low-pressure air can force seawater out of the ballast tanks to keep it floating above the water. How Deep Can You Go in a Submarine? That's classified. What the Navy can tell you is that their submarines can submerge deeper than 800 feet. But they don't go as deep as the research subs that explore the seafloor. How Long Can Submarines Stay Underwater? The Navy's nuclear-powered submarines can stay submerged for long periods of time. Air isn't a problem as their make their own oxygen and keep the air clean. The limits on how long they can stay underwater are food and supplies. Submarines generally stock a 90-day supply of food, so they can spend three months underwater. The diesel-powered submarines (not now used by the United States Navy) had a limit of several days submerged. They couldn't run the air-breathing engines while fully submerged and had to rely on battery power and electric motors when underwater. They would have to surface and use the snorkel mast for air for the diesel engines to recharge the batteries and exchange fresh air. Can You See Outside When You are Underwater? No, Navy submarines don't have windows or portholes so the crew can watch undersea life. Submarines have only periscopes for outside vision, and those are only used close to the surface, a periscope depth (PD). Submariners can look around 360 degrees with the periscope to find other ships and aircraft in the area and to gain information on a target they plan to attack or shipping to avoid. Submarines use sonar when they are submerged to obtain information on enemy targets, underwater terrain, and other hazards. What Does it Look Like Through the Periscope? Modern periscopes not only have the dashed lines you are familiar with from old movies, but they also have night vision, video and still cameras, magnification and internal antennas. How do You Know Where You are Going Underwater? 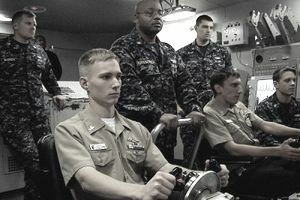 Navigation is set by the Submarine Navigators and Quartermasters and guided by computers on the ship. They use ocean navigational charts. The ship receives signals from Global Positioning System (GPS) satellites when near enough to the surface to use an antenna. and Quartermasters use ocean navigational charts They can also use a sextant when on the surface. Can you Feel the Waves on a Submarine When it's Under the Water? Normally, a submerged submarine will not rock with the motion of the waves on the surface. It is only in the most violent hurricanes and cyclones that wave motion reaches as much as 400 feet below the surface. In these conditions, submarines can take a five to ten-degree roll. How Fast Can a Submarine Go? This is classified as well. However, U.S. nuclear-powered submarines can go faster than 23 miles per hour, which is 37 kilometers per hour or 20 knots (nautical miles per hour) underwater. Why Can a Submarine Go Faster Underwater than on the Surface? Surface Tension: The shape of the tear drop hull design allows a submarine to slice cleanly through the ocean when there is water on all sides - as well as house sensitive sonar equipment. But when it is on the surface, it uses energy to generate the bow wave and wake. and then less energy is put into propulsion. Designs for World War II vessels and the first nuclear-powered submarine, USS Nautilus, had narrow bows to move faster on the surface than they did underwater. How Do You Get Air on a Submarine? A submarine has access hatches to bring in outside air when in port, and a snorkel mast to bring in air while submerged at periscope depth. Once submerged below periscope depth, equipment continuously clears the air of contaminant and oxygen-generating equipment to further replenish the air. The quality of air is continuously monitored. Recently, the Navy banned smoking on submarines. They used to smoke in a designated area on the submarine only with surfaced and receiving fresh air and they would announce the "smoking lamp is lit." Submarines use specialized equipment to communicate with shore bases and ships, either directly or through a satellite. Submarines can send and receive both voice and non-voice information. Submariners can send and receive email while in port and under limited conditions while at sea. Letters and packages are delivered when in port. They can also use Very Low Frequency (VLF) radio that actually travel underwater to depths of 60 ft at 3-30 kHz. Sonar (SOund NAvigation and Ranging) is used to detect ships and submarines, and it includes passive and active types. With active sonar, a pulse of sound is transmitted and bounces off objects in the water. It sounds like the pings you've heard in movies about submarines. The equipment listens for the return of the bounced signal to indicate direction and speed of the object. However, other ships and submarines can hear these active sonar signals and know where your submarine is. Passive sonar listens for sounds coming from objects, including other ships and submarines. It doesn't give away your position. Skilled sonar operators can determine many qualities of ships, submarines and marine life from these signals. A submarine can often hear a ship as well as large sea life (whales / dolphins) miles away. How Do You Escape from a Sinking Submarine? Navy submarines have two escape trunks, which are like air locks and can be used as escape routes. You would put on a life preserver that has a hood that provides a bubble of air to breathe, and then enter the escape trunk. The lower hatch is shut, the trunk fills with water and comes up to sea pressure. Then the outside hatch is opened, and you float to the surface. How are People Rescued from a Sunken Submarine? The Navy has rescue submarines called Deep Submersible Rescue Vehicles (DSRV), as seen in the movies, Hunt for Red October, or Gray Lady Down. They can attach to the escape trunk of the sunken submarine and take on the crew. The next generation rescue system is called the Submarine Rescue Diving and Recompression System. Have Any U.S. Nuclear Submarines Been Lost? Two have been lost. The USS Thresher (SSN 593) sunk on April 10, 1963 while on sea trials and the USS Scorpion (SSN 589) was lost on May 27,1968 while coming from a deployment in the Mediterranean Sea. During World War II alone, 52 submarines were lost. That was one in every 5 submarines sunk or lost. Before and after the War, nearly 20 were lost due to accidents. U.S. Navy Submarine Force Museum - Includes the USS Nautilus, USS George Washington and USS X-1. Groton, Connecticut. Naval Undersea Museum: Keyport, Washington. There are dozens of other submarines on display at museums. You can find them with an online search for submarine museums.